Cosmetic Bonding is the application of a tooth-colored composite resin to repair a chipped, fractured, or discolored tooth, and it can also be used to make teeth appear longer. Bonding can be done in a single visit to Dr. Skupny. Bonding is among the easiest and least expensive cosmetic dental procedures we provide. The composite resin used in bonding can be shaped and polished to perfectly match the surrounding teeth. Most often, bonding is used for cosmetic purposes to improve the appearance of a discolored or chipped tooth. It can also be used to close spaces between teeth, make them look longer, or change their shape or color. The first step is to schedule a consultation with Dr. Skupny so you can discuss your treatment goals. He will use a shade guide to select the composite resin color that best matches your smile. Once he has chosen the color, he will slightly etch the surface of the tooth to roughen it. The tooth will then be coated lightly with a conditioning liquid, which helps the bonding material adhere. When the tooth is prepared, Dr. Skupny will apply the tooth-colored, putty-like resin. The resin is molded and smoothed out until it’s the proper shape. Then, the material is hardened with an ultraviolet light or laser. 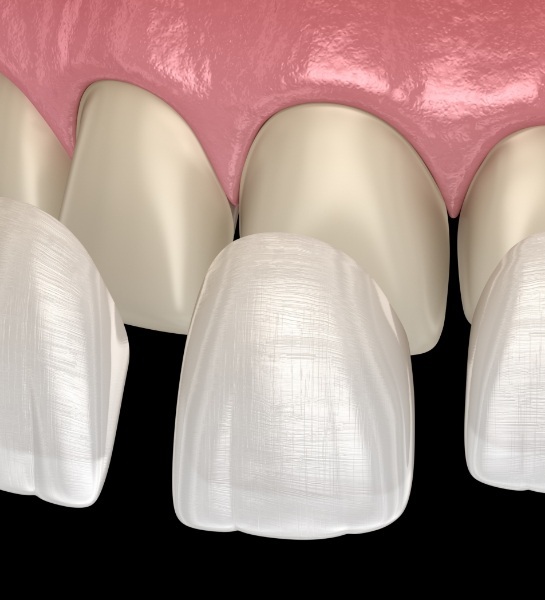 After the bonding material hardens, Dr. Skupny will further trim, shape, and polish the material until it matches the sheen of the rest of the tooth surface. This procedure usually takes 30 minutes to an hour to complete. If you’re having more than one tooth done, you may need to schedule more time or additional visits. Dr. Jeffrey Skupny uses a variety of dental services and techniques to provide the very best results for all of our patients. His artistic abilities and experience, along with his use of the finest materials and products, help him consistently create healthy, strong, and beautiful smiles. Contact our Naples dental office in Collier County today to learn more about cosmetic bonding and the other dental options available to you.